I’m going to say that when I first saw the LuDeLa Perfect, I thought I had it all figured out. I said: “I get it. It’s a smart candle.” Now, considering that candles are technology from at least the medieval times, that’s like saying you have a “smart rock” or something. The truth is that the LuDeLa Perfect is a smarter candle, but it is not necessarily a candle that you can pair with your smartphone. I will explain more of what I mean later, but let me explain why the LuDeLa Perfect is the candle for you. First of all, let’s talk candles. If you are like me, you grew up with them, and you know how good they are at setting the atmosphere, but occasionally not working correctly. You know how you get those ones that great that tunnel effect, or ones where the wick gets so buried by wax that it won’t work anymore? Well, the LuDeLa doesn’t work that way, as it always keeps the wick on top. Yes, the LuDeLa changes technology that probably hasn’t changed for a millennium, or however long candles have been around. The flame always stays on top, so the lighting is consistent, thanks to its Everbrite Flame feature. You can see from the image here how different these are from regular candles, and these Caring Candle Refills will keep the candle burning as good as new. Oh, and you know how candles melt, drip, and can make everything so messy? A special feature known as the Forever-New Decor (TM) will keep it so the candle always looks brand new. And if you don’t like the way it looks, and decide to change the color of the outside, or the design, you can apply the Flex-Decor (TM) feature and do it. Also, you know how buying a scented candle results in having that scent as long as you have it? Perhaps you should consider switching out the scents, and yes, you can do that with the Scent-On Demand (TM) feature. Oh, you can also set a timer for your candle, so if you want it to go off at a certain time, that can happen. It’s called the Timer Extinguish (TM). If you look closely at the main image above, you can see buttons for a certain number of hours. Pretty cool, right? I’ll get more into safety later, but thanks to the Tilt Extinguish (TM) feature, the candle will automatically go out if it is knocked over. I’m guessing that will save quite a few lives every year, as there are 25 candle fires in the United States every day. Believe it or not, it is candle safety that is the inspiration of how this Kickstarter project started out. LuDeLa founder Jamie Bianchini was on a tour of the world on a bike, and stayed at a place in Africa. He had a candle fire that he was able to put out, but it had a profound effect on him. Oh, in case you were wondering if Jamie’s story about riding around the world on a bike is worth reading about, the answer is yes, and you can find out more info here at A Bicycle Built for Two Billion. 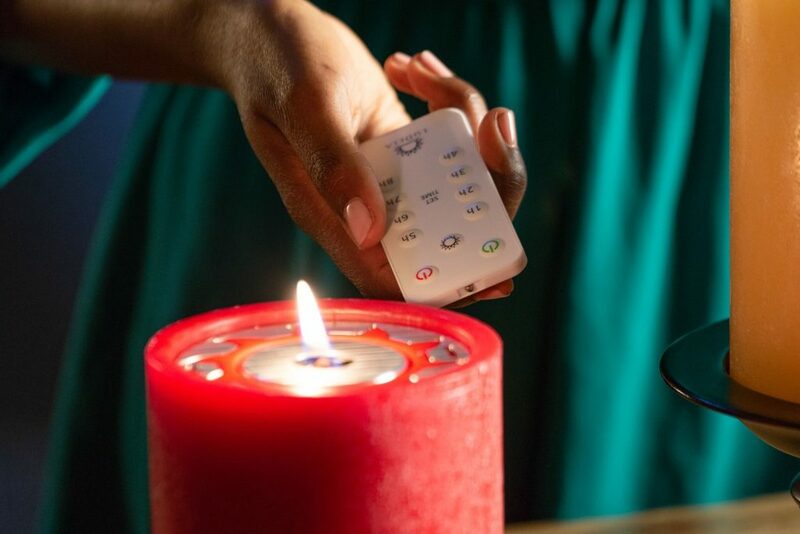 I might do a story on that tangent someday, but Jamie envisioned the idea of a smart candle, but figured out after he received funding that a candle that lights itself using Bluetooth is actually dangerous. 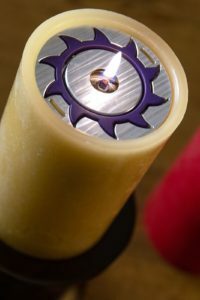 It is safer to create a candle with sensors all about it, as well as a remote that uses IR frequency or line of sight for extra safety. Jamie then asked his donors if they wanted their money back, or they would be willing to wait for a safer model. As it turns out, 95 percent of the donors wanted to wait. I have a video you can watch below that is outdated (made in 2016), but I found it worth posting here because it has the creator, Jamie, and his cute two kids with him. In a recent interview that I did with him, Jamie told me that he might take the video down, so if it isn’t there, don’t blame me. Now, I’m sure you are wondering where and when you can buy these LuDeLa Perfect candles. You can check them out with the exclusive Kickstarter campaign that started just last week. If you need more motivation to purchase, then you should know this: for every LuDela candle product sold, a book will be donated to bring libraries to under served communities.